Beauty is only skin deep—so you better hope your skin looks damn flawless. (Insert Beyoncé hair toss.) If your complexion tends to veer on the dry, dull, and flaky side, and no amount of slathering on moisturizer seems to be doing the trick, it may be time to turn to another method. 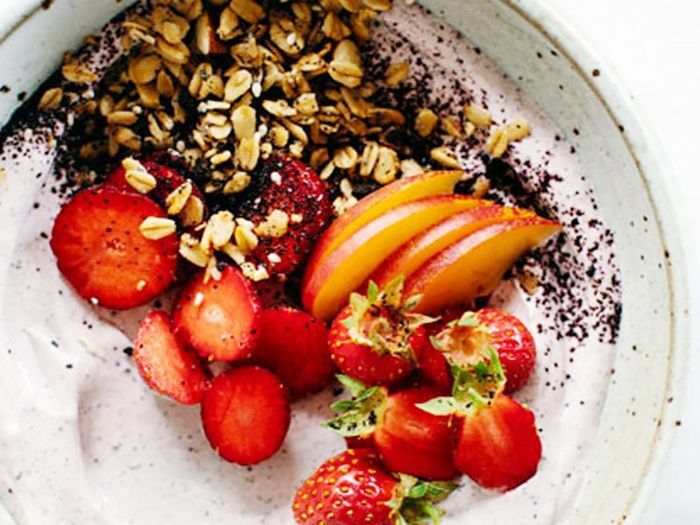 Enter: the diet for hydrated skin, or rather, the seven foods you should start eating immediately if you want glowing skin. Though we’re fans of putting various kitchen staples on our faces, there are also skin benefits that come from simply consuming certain foods. And the best part? Chocolate is on the list. Keep scrolling for seven foods that cure dryness from the inside out! To help us create this list, we turned to Dr. Roshini Raj, gastroenterologist and co-founder of probiotic skincare line Tula. Raj was quick to name some of her favorite hydrating foods, the first of which is broccoli. “Broccoli is 90% water, so it’s a great food to work into your diet to keep your skin hydrated from the inside out,” Raj says. “A nutritional powerhouse, broccoli is also rich in antioxidants such as vitamin C and E.” For those unschooled, vitamin C stimulates collagen production and helps your skin stay plump, while vitamin E protects your skin cell membranes against free radicals. Broccoli also contains something called sulforaphane—Raj explains that it’s a potent compound that boosts your body’s protective enzymes, shielding your skin from harmful UV rays. Ever heard of catechin? It’s an antioxidant that gives your skin that lit-from-within glow, and can be found in large amount in radishes. Raj also notes that radishes are 95% water, which makes them super hydrating, and rich in silicon and sulfur—two things that will boost your skin health and build stronger, healthier hair. Surprisingly, fruits and veggies aren’t the only hydrating foods. Raj brings up the fact that a regular plain yogurt is made up of about 85% water, and a great source of probiotics. These good bacteria are proven to have powerful skincare benefits. “There is a well-known link between the health of your gut and the health of your skin,” Raj says. “Increased numbers of the good bacteria in your stomach can help fight against damage caused by free radicals, allergens and other environmental factors. When ingested, probiotics line the gut and create a healthy and sealed barrier, which can prevent system-wide inflammation that might trigger acne or rosacea." You can read more about the link between probiotics and your skin right here. Next time you’re craving a snack, grab a handful of walnuts. Not only are they full of good fats, but they also contain copper, a mineral that Saini says increases collagen production in the skin. “Eating a few walnuts a day will improve your skin’s texture,” she promises. Berries like blackberries, blueberries, and strawberries make for great pies and also happen to be amazing sources of skin-boosting antioxidants. Saini says these antioxidants specifically protect your skin cells from free radicals that come from pollution, sun exposure, and more. If you want to branch out from the traditional, try incorporating goji berries to your diet—they’ve been used for centuries in China to promote clearer, brighter skin. And now, for the clincher: chocolate can actually help you reach your hydrated skin goals, according to Saini. “Cocoa hydrates your skin, making it firmer and adding a healthy glow,” he says. To maximize your results, he suggests choosing chocolate that’s at least 70% cocoa. “Eating a couple of squares a day can improve your skin’s appearance,” he promises. You don’t have to tell us twice. Do you follow this diet for hydrated skin? Click here to find out the seven-day diet plan that will help you beat acne.